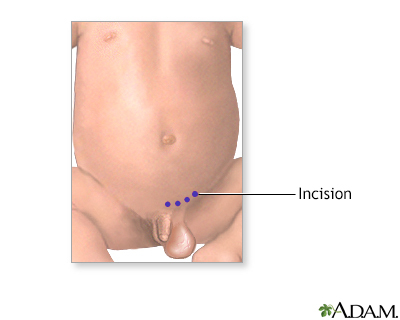 During development, the scrotal cavity in boys is connected to the abdominal cavity via a structure called the processus vaginalis. The processus vaginalis usually closes at birth, or soon after. When the processus vaginalis does not close, or closes after fluid from the abdomen has become trapped in the scrotal cavity, it is called a hydrocele. The canal (inguinal canal) between the abdominal cavity (peritoneum) and the scrotum remains open. Fluid from the peritoneum enters the canal and the scrotum, and causes swelling of the scrotum. In some cases, bowel can also pass through the processus vaginalis into the scrotum. This is called an inguinal hernia. If a hydrocele persists past the first six to 12 months of life, it should be surgically repaired. Inguinal hernia in infants is usually repaired within the first three months of life. It is sometimes difficult to distinguish a hydrocele from an inguinal hernia on exam. Surgery usually completely corrects the defect, and the long-term prognosis is quite excellent. Hydrocele repair is done on an outpatient basis and recovery is usually brief. Most children can return to normal activity within about four to seven days.